The Doctor and Peri journey to Los Angeles 2009 to do battle with a Piscon. His name is Zarl, and he’s a fish of utmost evil. Zarl is going to steal all the water of Earth and sell it to the highest bidder. Or blow up the San Andreas fault. Or the planet. Or something like that. He’s a bit vague on that point. Fortunately, to stop him there’s help from an unexpected source: a future version of Peri. She knows Zarl’s dark secret. But should the future Peri be on Earth at all? Something smells fishy – and it’s not just Zarl. It’s nearly impossible to get into the mind of the Doctor. On television, via comic strip and graphic novels, and in audio format, viewers get to hear the Doctor think and plan out loud, or provide a summation of his grand scheme once everything has come to pass. But while viewers see the Doctor’s thought process, they don’t get to be PART of the thought process. All they observe is the end result(s) of his cleverness, and all the sense is the bare surface of the depths of knowledge over a thousand years of time and space travel have given him. If one was to write a story about the Doctor, describing what the Doctor was thinking and just how he puts his plans together from the Doctor’s point of view would be a monumentally difficult task. Over fifty years of stories and adventures have shown that the Doctor operates on a plane far above anything a “normal” person in the Time Lord’s universe could possibly comprehend, and that includes several of his Time Lord acquaintances! One could imagine seeing into the inner workings of the Doctor’s mind would be like read the Necronomicon; one could follow along, but the confusion and sheer alien nature of it could quite well drive one mad. In this regard, the concept of a “companion” is a huge help, to both the Doctor and the viewer. Some might decry a companion as “merely someone who asks the Doctor questions as the plot demands,” but their presence also gives insight into how the Doctor thinks. The Doctor might ask THEM a question, or point out something interesting that he’s already noticed. The companion, therefore, allows the Doctor to peel back the curtain slightly without ruining the mystique of something that would be impossible to portray properly. 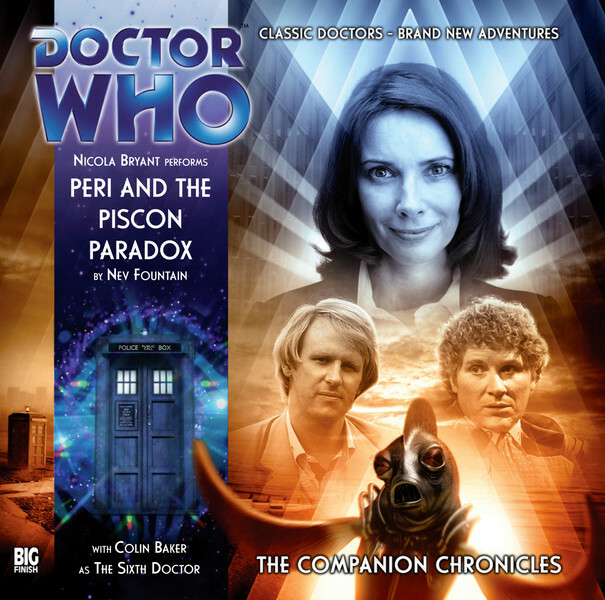 Written by a veteran writer of radio, television, and Big Finish audio, Peri and the Piscon Paradox comes from Big Finish’s range of Companion Chronicles, as Peri and the Fifth Doctor find themselves battling against an evil alien with the help of none other than Peri Brown! The Piscon Paradox is a story with one main actor, one supporting actor, and a solid mixture and humor, all wrapped up with a bow that delivers one hell of a gut punch by its very end. The Fifth Doctor is actually part of a vast social network, connected to a number of alien species, some of which boast of their nefarious schemes for the entire galaxy to hear and for the Doctor to thwart. The Piscon known as Zarl is one of those beings. An aquatic, fish-like alien with a death wish, Zarl plans to steal the Earth’s water. Or blow up the Earth. Or maybe just cause the San Andreas Fault to shift. The Doctor and Peri arrive in Los Angeles, 2009. While the Doctor attempts to defeat Zarl without killing him, Peri is stunned by the difference 25 years has made. Not just in Los Angeles, but in Peri herself! An older, wiser Peri, who claim to be working for a secret alien-hunting organization and vows to help her younger self and the Doctor defeat Zarl before he can cause grievous harm to the planet. The Companion Chronicles, as mentioned earlier, are a range of audios produced by Big Finish that focus on the adventures and experiences of the Doctor’s companions. The stories take place in a variety of styles. Sometimes, the companion is at the Doctor’s side. Sometimes, the companion (or companions) find themselves alone, either during or after their time travelling with the Time Lord, facing peril, danger, and adventure. The stories can take the format of a two-hander, or be performed in an audiobook style with straight forward prose and character voices provided by the companions, as well as being done with strictly first-person narration. The Companion Chronicles allow Big Finish a large degree of creative freedom about the Doctor and his companions. The stories allows listeners to see the Doctor through the eyes of their companions, human beings (normally) who look upon the Time Lord with a mix of wonder, caution, and apprehension, opening up a new avenue of telling thrilling tales. Also, it allows Big Finish to create new adventures featuring the three Doctors who, sadly, are no longer with us, with the parts of the companions played by their still living actors. Through the eyes of companions such as Zoe and Jamie, listeners can travel alongside the Second Doctor, or experience the thrilling tales of the Third Doctor as told by Jo Grant. Even the First Doctor gets his time in the spotlight thanks to Steve and Susan. With a solid formula in place, Nev Fountain takes a different approach to the Companion Chronicles. Fountain is best known for his writing work as part of the BBC parody series Dead Ringers and the panel show Have I Got News For You. He’s also written for Doctor Who in the form of several comic strips, a couple of Bernice Summerfield novels, and two Big Finish serials; Omega and the hilarious “Shakespeare” tale The Kingmaker. With Peri and the Piscon Paradox, Fountain attempts to undo one of the biggest Gordian knots in all of Who continuity – what exactly WAS the final fate of Peri Brown? In 1986, Doctor Who was in a bit of a rough patch. It had been take off the air for almost 18 months, and questions abounded as to whether or not Colin Baker was going to continue on as the Doctor. Producer John Nathan Turner brought the show back with a season long story arc called “The Trial of a Time Lord,” where a future incarnation of the Doctor’s calling himself the Valeyard arranged for the Doctor to be put on trial by the Time Lords for, among other crimes, genocide. During the course of the story Mindwarp, Peri, the Doctor’s companion at the time, was supposedly killed due to the actions of the story’s antagonist despite the best efforts of the Doctor and a warrior king named Ycarnos (played by none other than BRIAN BLESSED. In the season finale The Ultimate Foe however, the Doctor discovers that Peri did not die, but instead married Ycarnos and became his warrior queen. For watchers of the television show, it was a poorly written sendoff, but a sendoff nonetheless. With regards to the expanded Doctor Who universe, however, things get a little sticky. The audio drama Her Final Flight saw the Sixth Doctor encounter a fake Peri, which raised his memory of encountering the older Peri in Los Angeles (he blames the fuzziness of his memory on post-regeneration amnesia) and directed him to 2009. However, the Doctor also went looking for, and encountered, “Warrior Queen” Peri in the Colin Baker-penned graphic novel The Age of Chaos. And in Virgin New Adventures Novel Bad Therapy, the Seventh Doctor encounters the vengeful “Queen Gilliam,” who waited for him for a month before embarking on a campaign of conquest across the galaxy. Also, please note that there are not four Peri’s from four alternate universes. They’re ALL the “real” Peri, existing in this universe thanks to the Time Lord’s “attempts” to fix the timelines after The Trial of a Time Lord. Everyone got that? Good. Now someone please explain it to me. The concept of a younger companion meeting their older self is one that’s never been done on the television show, as the often-mentioned Blinovtich Limitation Effect (or the Back to the Future Part II rule if you’re so inclined) states that two people temporal versions of the same person can’t come into contact without causing very nasty energy discharge. It seems like Fountain simply handwaves this staple of the show away for the sake of the story when the older Peri touches the younger Peri, much to the Doctor’s dismay and then surprise at the lack of a big boom. But it ties into the final scene and the final fates of all the Peri’s. I apologize for all the backstory and background. The good news is that a listener can enjoy Peri and the Piscon Paradox without knowing ANYTHING other than the fact that Peri travelled with the Fifth and Sixth Doctors at some point in her lives, and there seems to be some kind of temporal snarl about which Peri is which and where she should be. As there wasn’t exactly a large battle cry from the fandom to “fix” the Peri situation, Peri and the Piscon Paradox doesn’t hinge its plot on trying to ret-con/pro-con Peri’s past. Instead, Fountain uses it as the coda to what’s a pretty solid two-sided “meeting your future self” story, as opposed to turning in an Ian Levine-style continuity festival. Unlike most Companion Chronicles which limit themselves to one CD, Peri and the Piscon Paradox takes up nearly every single bit of space on two CD’s. The first CD is a straight forward narration by Peri, the television version of herself who only travels with the Fifth Doctor in two stories, Planet of Fire and The Caves of Androzani. She’s younger, wide eyed, optimistic, and sarcastic to a fault. The Fifth Doctor and Peri are trying to stop Zarl, a Piscon, from his dastardly plan…whatever it might be. This part of the serial is a “chase” style adventure with some humorous moments and several scenes that are best explained when the second part of the story unfolds (and vice versa, as the second part has a few scenes that need the first part to fully make sense). The listener gets to see the Fifth Doctor as Peri sees him (floppy haired, nicely dress, and kind of cute) as well as how Peri sees 2009 Los Angeles, with comments on stick figures models on billboards and the shopping malls of the time, as well as poking fun at her own fashion sense and how she always choose to wear heels over flats! Fountain also takes the time for the two Peri’s to examine each other, as the younger Peri wonders over her older self’s new nose and the older Peri wonders how the hell “those” were ever so perky. Fountain takes full advantage of the idea of meeting your future self, with Peri asking what happens to relatives and beloved pets and what ever happened with her boyfriend. As the story unfolds, however, the younger Peri realizes that the secret agent spiel that her older self is spinning is a line of complete bull. Without spoiling anything, the younger Peri screams that she’ll never be like her and spirits away with the Doctor in the TARDIS…this story helps explain just why Peri was running away in Planet of Fire and why, even after the shock she receives with Six’s regeneration, she would choose to stay with him, working through their abusive relationship to form the core of a solid and respectful partnership. The second half of the story is more “farce” than chase, as we see the attempts of the Sixth Doctor to goad the Fifth Doctor to fight him (“I’m in a fish costume and he’s still wetter than I am!”) while causing no undue harm to him, and just the older Peri explains to the Doctor and her younger self that she’s a secret agent fighting alien invasions, to help the Sixth Doctor with his masquerade. But it’s during this second half that the more serious elements of the story begin to seep in. The older Peri drops hints, though her narration, that her life didn’t turn out as glamorously as it should have, and the reason why keeps dancing along the edges of the story. It’s not hard to figure out what happened in the grand scheme of things, but the specifics are left until the climax of the story between the younger Peri and the older Peri, and that’s when the gut punch hits. Where the younger Peri swore up and down she would never become like the older Peri, the older Peri tells her to do everything she could NOT to become her; bitter, jaded, and with a personal history that reads like 10 miles of broken road. For a moment, the listener if left to wonder if this truly is Peri Brown’s final fate; to be famous and beloved, but broken and bitter, with one really haunting line delivered in heartbreaking fashion after the Doctor offers to take the older Peri with him once again. And then a Time Lord shows up. And everything makes a twisted sort of sense. In the end, no matter what, Peri’s life ended up a mess. The Doctor couldn’t help her, either as a warrior queen or an aspiring celebrity. One question from Peri, when asked by the Time Lord if she wants to just have everything erased, sums up the entire serial, and allows the older Peri to walk out of the TARDIS with some sense of closure. Not with her personal life, but with the way everything turned out for at least one of her lives. It could have been very easy for the entirety of Peri and the Piscon Paradox to be nothing more than humorous melodrama with an ending designed solely to tug at a long time Whovian’s heartstrings. There’s one thing that prevents this from happening, and that’s a performance by Nicola Bryant that absolutely knocks it out of the park. Hands down, this is Bryant’s best performance that I’ve heard in the three years I’ve been listening to Big Finish as she easily establishes two distinct personas of the same person. We’re all familiar with the young Peri from television, with pastel shirts and some amazing underwires, as well as the Big Finish Peri, who’s gotten to show off her (mentioned but never utilized) academic background alongside Peter Davison and Colin Baker. She’s not afraid to say what’s on her mind about the situation and about the actions of the Doctor. It’s Bryant’s performance as her older self that stops the clock. The personality of the younger Peri is there, but the voice is deeper from too much coffee and too many cigarettes, the sarcasm has been sanded down by time to bitterness, and Bryant delivers her thoughts about her younger self with a mix of amazement, condescension, and nostalgia. The urge for her younger self to discover what she can of her future against the attempts by her older self to protect her from the broken fairy tale that her life becomes is portrayed wonderfully by Bryant. It’s pretty much a one-woman show (with one exception), but Bryant doesn’t just put Peri into the dialogue, but into how she explains the actions and scenery around her. She never overacts or embellishes to the point of excess, and the straightly delivered dialogue and descriptions set the scene no matter how desperate or silly it is. And the thought of the Sixth Doctor in a fish costume is as silly as it gets. The only drawback from Bryant’s performance comes about from the simple fact that I am an American, and hearing Peri, with her “American” accent, pronounce some of the dialogue with English pronunciation was just a bit jarring, as well as her “impersonation” of her Southern producer and best friend. An English woman with an American accent imitating a Southerner is just…weird. While Nicola Bryant is all alone in the first part of the story, Colin Baker joins her for the second part, but in a supporting role. This is Peri’s tale, not the Doctor’s, but Baker’s presence helps to sell the absurdity of dressing up as Zarl and the sadness when he realizes just how he’s failed Peri despite his best efforts. As Peri doesn’t have quite the relationship with the Fifth Doctor as she does with the Sixth (as I mentioned earlier, this story’s Peri only travelled with the Doctor in two stories), having Bryant simply narrate his dialogue and actions works fine. Having Baker guest star and portray the hapless Sixth Doctor attempting to make sure the Fifth Doctor “defeats” Zarl adds a good bit of humor to the second half of the story, as well as adding to the emotional weight of the finale as he realizes what really happened to all those Peri’s, and there was nothing he could have done about any of it. But Baker doesn’t overshadow Peri’s story at all, adding to the story with his presence. It’s not all dialogue, as the sound sets the stage for 2009 Los Angeles, with pedestrians, cars, beach goers, and the sounds of the Piscon spaceship as it rises from the water. The music itself is the audio standout. We get the light jaunty farcical theme at times, along with some stirring music as the chase commences and a nice take off of the theme song to the BBC sitcom that Peri’s favorite café is modelled and named after. The second half of the story kicks it up a notch, with the background music to the climax and the coda one of the more memorable scores I’ve heard from Big Finish. In some ways, the life of Peri from Peri and the Piscon Paradox mirrors her time with the Doctor. She goes from the young and exciting Fifth Doctor to being choked by the Sixth Doctor, who is more grounded and slightly more jaded than his younger counterpart. This Companion Chronicle makes a fine companion piece for Peri Brown, not just for those who want to know just what the heck is up with her character’s final fate. It’s also a great insight into just how a companion sees the Doctor when they’re traveling with them AND how they react when the Doctor’s gone and they have to continue with their life without him to catch them if they fall. Bryant delivers a wonderful performance of Fountain’s script, with Colin Baker providing the support. I can’t recommend this one enough for those listeners who want to try a Doctor Who story that’s just a little different. Synopsis – Peri and the Piscon Paradox shows life from the companion’s point of view, as young Peri Brown collides with older Peri Brown in an effort to save the planet as well as coming to terms with some personal demons. 5/5. India Fisher is the companion in…Solitaire. This entry was posted in Big Finish Review and tagged Colin Baker, Companion Chronicle, Doctor Who, Doctor Who Audio, Doctor Who Review, Fifth Doctor, Nev Fountain, Nicola Bryant, Peri Brown, Sixth Doctor, TARDIS. Bookmark the permalink.